On display at the Victoria & Albert Museum is a mesmerising collection of over 150 objects, jewellery and paintings from the 16th and 17th centuries, shown to highlight the relationship between the British Monarchy of the Tudor and Stuart courts and the Russian Tsars. This exhibition would be of interest to anyone fascinated by hand crafted objects from this period, with some being good enough to be presented as gifts to foreign Royalty. Within this exhibition are three gold finger rings that were made in the 16th - 17th centuries. One is an ancient sapphire intaglio set within an early 17th century ring, another is a memorial / wedding ring circa 1550  1600 and lastly a signet ring circa 1580, all with decorative scrolling shoulders, which are interesting comparisons to some important new additions to our collection. The V&A holds a vast array of important rings from this period and we are lucky to have such pieces of museum quality here at Berganza. The Treasures of the Royal Courts exhibition coincides with our recent acquisition of an extremely rare medieval ring, circa 15th - 16th century. It is a yellow gold ring set with a faceted ruby and is in excellent condition. At this time, rubies would have come from both India and Ceylon, and diamonds were rare. By the early fifteenth century diamonds and gemstones were being faceted as this brought out the desired reflective properties that the earlier cabochon cut gemstones just didn't display. Yellow gold would have come from various sources, as it was being imported from the Arab world and European production was increasing, with the first gold producing mine in Europe being at Trenmitz in Bohemia, discovered in the 1320s. This ring is a rare and fascinating example of early gemstone cutting, set within its original typical crescentric scalloped closed back quatrefoil collet, tapering inwards to trumpeted supportive shoulders carved with foliate imagery and further detailed with niello inlay. At approximately 500 hundred years old, this is still set with its original ruby and is in remarkable, wearable condition. Comparable pieces to this new addition are our earlier medieval amethyst cabochon ring, circa 14th  15th century and the cabochon sapphire ring circa 12th  15th century . This rounded effect of a cabochon was gained by polishing and rubbing the stone, which is seen prior to the early 15th century. The amethyst probably came from Europe, as quartz at this time was found in Germany, France and Switzerland, with amethyst being the purple variety. Sapphires were a popular choice, coming from Ceylon and encircling regions, finding their way to jewellers via trade routes. From the 15th - 16th century we have a silver signet / fede ring in our collection. Silver was produced mainly in Western Europe and was also gained as a by-product of lead mining around this time. It was considered the second most precious metal to gold and was also used as settings for gemstones. This piece is engraved with an image of a dog, representing fidelity, two overlapping hearts and two clasped hands to the rear of the shank, making this a fede ring of love imagery. This is a fair size, leading us to believe this may have been the wedding band of a noble man. Furthermore, we have another new addition from the 14th  15th century of a silver gilt seal ring engraved with an image of the Agnus Dei. This has an oval bezel with intricate engraving and dotted border, bearing resemblance to the signet ring in the aforementioned exhibition at the V&A and the detailing in the signet / fede ring above, which would have been worn by a gentleman of religious belief. Rings from the late medieval period that are in fine condition are extremely rare. Those detailed above are fantastic examples of the types of workmanship seen at this time, across different metals and serving different purposes. To own and even wear a medieval piece of such rarity is to own a piece of jewellery history, comparisons of which can be seen on display in museums and in portraits from this time. 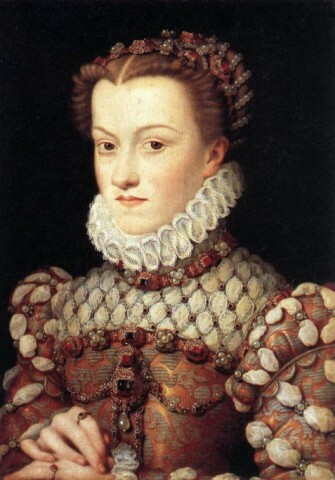 See pictured, Queen Elizabeth of Austira, 1571, with two yellow gold rings set with early faceted gemstones, and further to her dress. The 'Treasures of the Royal Courts' exhibition is on display at the Victoria & Albert Museum until July 14th 2013. Sources: Cherry, J. 'Medieval Goldsmiths', The British Museum Press, 2011. For comparison: Scarisbrick. D, 'Rings, Jewelry of Power, Love and Loyalty' Thames & Hudson, 2007, Page244. Oman, C.C, 'Victoria and Albert Museum Catalogue of Rings 1930' Anglia Publishing, 1993, image 281, 16th century, image 256, 13th or 14th century. Medieval amethyst cabochon ring, circa 14th - 15th century.